If “the purpose of life is to contribute in some way to making things better”, how might we make mathematics better? Teachers often explain multiplication and division with repeated addition and subtraction. Yet such approaches do not extend beyond the positive integers. By contrast, the ideas of René Descartes and Isaac Newton on multiplication and division can be extended from the naturals to the reals. 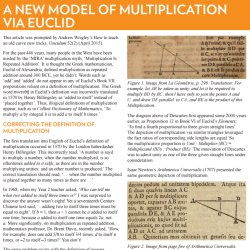 So, I reveal how, if they were alive today, they might explain multiplication and division visually in ways seldom seen in western mathematics curriculums. My AAMT conference slideshow appears below.